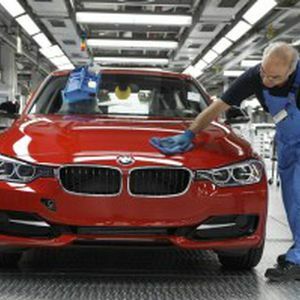 German luxury carmaker BMW last week announced a billion-dollar investment to build a new plant there that will produce 150,000 vehicles a year starting in 2019. Mexico has become one of the world's emerging auto manufacturing hubs, despite persistent questions about security. In fact, foreign direct investment in the country is at a record high. BMW is actually one of the last global premium automakers to make a major move into Mexico. Nissan (NSANF) and Mercedes (DDAIY) also said they would begin producing premium vehicles there. Rival automaker Volkswagen (VLKAF), which also produces Audi, traces its presence there back to the 1960s. With so many brands now operating in the country, some analysts suggest BMW couldn't afford to stay out any longer. "The American continent has a very important function in the international growth strategy of the BMW Group," the firm's production chief, Harald Kruger, said in a ceremony hosted by Mexico's President Enrique Pena Nieto. "And now, with Mexico, it will continue to grow." Free trade deals, low wages and proximity to the prized U.S. market are enticing. Mexico is now seen as being even more competitive than China, according to a recent Bank of America study. BMW is basing itself in San Luis Potosi, a state some 400 km north of the capital Mexico D.F. The U.S. State Department currently advises against all but essential travel to that state with the exception of its capital, the city of San Luis Potosi. "We didn't have to reassure them," says Mexico's Economy Minister Ildefonso Guajardo Villarreal "They traveled intensively in Mexico and they experienced firsthand the conditions of security and tranquility in those areas. Mexico is a map and you have different rates and circumstances in terms of crime." Mexico has also embarked on an ambitious economic reform agenda, with sweeping changes planned in various sectors of the economy including energy and telecoms. This has boosted investor confidence, offsetting the country's disappointing economic growth in the last year. "I think growth is improving as we move forward," says Steven Palacio of JP Morgan. "Exports to the US are picking up, the construction sector is reactivating, we are seeing also the services industry starting to grow. And what's more important, I think, is markets are realizing the potential that the different reforms could have on Mexico's growth story in the medium term."